What are the Best Tips for Building a Railroad Tie Retaining Wall? Taking railroad ties from train tracks is illegal. Perhaps the most important tip for building a railroad tie retaining wall is to be careful when handling the railroad ties. These pieces of wood are coated in creosote to help the ties last longer when used as supports for railroads, and the wood can splinter, causing a risk that the wood can cut or puncture the skin. Wounds that result from handling railroad ties can easily become infected and they will be slow to heal, so leather gloves should be worn when handling the ties. Building a railroad tie retaining wall will obviously require the builder to find some railroad ties, but he or she should never take railroad ties from a railroad yard or near railroad tracks. 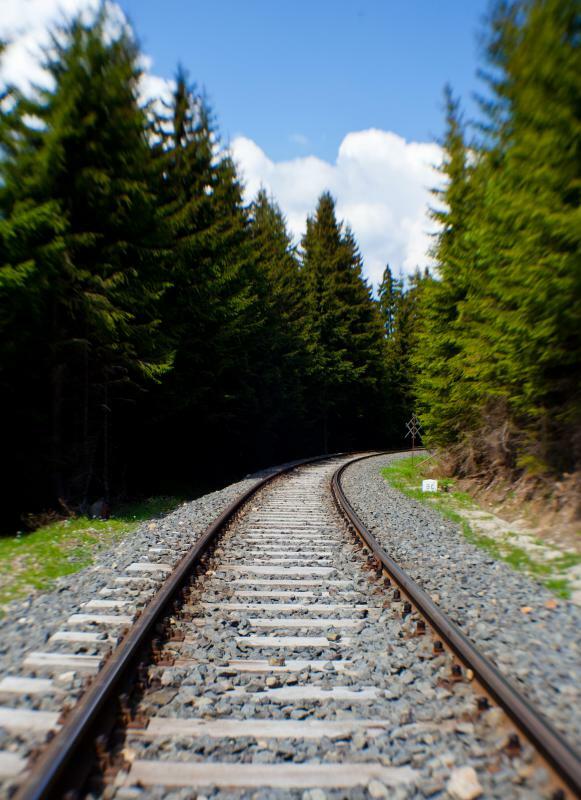 Railroad tracks are private property, or in some cases it is federal property, and trespassing on or near railroads is illegal and can lead to criminal charges. Taking railroad ties from this property is also illegal, so when building a railroad tie retaining wall, the builder should go to the local lumber mill or hardware store to find out where he or she can obtain railroad ties legally. A railroad tie retaining wall will require several ties depending on the size of the wall, and each tie is very heavy; the builder should be sure to bring help with him when purchasing the ties, since lifting the ties often requires two or three people. Two of the most common difficulties concerning the building of a railroad tie retaining wall focus on drainage and compaction. Water can build up behind the wall and cause it to buckle or collapse, so proper drainage techniques must be used to prevent such damage. Run-off channels drilled right through the ties can help vent some of the water, though this is certainly not the most aesthetically pleasing option. Backfilling the wall with a material that does not collect water can help prevent buckling during frosts; crushed stone works well for such an application. The materials that the wall holds up will need to be properly compacted. It may be worth renting the proper compaction tools for this process. If the soil behind the wall is not compacted, drainage issues will arise quickly, as will settling issues. The soil may move, thereby shifting the load behind the wall and potentially causing damage to the wall. Compacting the soil properly will help prevent shifting loads, and it will also help prevent drainage issues from arising shortly after the wall is built. What is an Interlocking Retaining Wall? What Was the Golden Spike? @Terrificli -- good tip, but there is an advantage to the weight of railroad ties. They are heavy enough to make good retaining walls, but not as heavy as an equivalent concrete product would be. You might actually be better off with the lighter railroad ties and you can haul more of them per load, too. Oh, one more thing. Quite often, railroads will have these for sale. They will be older because they are usually the ones that have been pulled from abandoned railroad beds, but the age of them is usually OK for a retaining wall. Oddly, one of the main problems people encounter around here i building railroad retaining walls is getting the things home. Those are very, very heavy and you will need a lot of them for a wall. More than one person has discovered the weight limit his pickup can haul by cramming too many railroad ties in the bed. You can do some major damage if you haul too much and exceeding that weight limit will probably void any manufacturers warranty on your pickup if you bring it in to get the damage repaired. A good tip, then, is to know the limits of your pickup and not exceed that limit with railroad ties. Make two or three trips if necessary so you won't damage your vehicle by overloading it.